The Philosophy of Thomas Aquinas: A Beginners Course, by Jonathan Dolhenty, Ph.D.
Thomas Aquinas was the first to recognize the fact that Aristotelian intellectualism would be of great help for the study of philosophy as well as theology. But the introduction of Aristotle’s works involved the solution of the disputed question of the relationship between philosophy and theology. At the time of Aquinas, besides the Averroist theory of the double truth, by virtue of which philosophy and theology were not only separate but opposed, there was also Augustinianism, which was largely accepted in the School and held that no real distinction between philosophy and theology was possible. This confusion between philosophy and theology was a necessary consequence of the theory of illumination, according to which the human intellect was considered incapable of abstracting intelligibles from the data of experience, but rather received them from the Divine Teacher. This Teacher communicated to the intellect the intelligibles regarding the material things of the surrounding world as well as those concerning the invisible and supernatural world. Thus the human intellect was capable of understanding not only material things but also the mysteries of religion. Hence no distinction between philosophy and theology was possible. 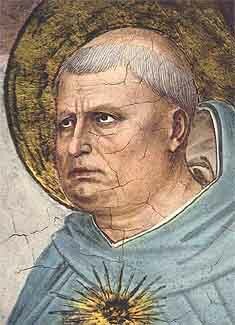 Thomas Aquinas sharply opposed both Averroism and Augustinianism. He did not accept the theory of the double truth, not only because of its irreligious consequences regarding the mortality of the human soul, but because he was convinced of the falsity of such a theory. If religion, therefore, teaches something that is opposed to reason, as the Averroists maintained it does, it would teach what is absolutely false and impossible. Two contradictory truths cannot be admitted; truth is one, either in the field of reason or of religion. The two fields are separate but not opposed. There are religious truths — such as the mystery of the Trinity and the Incarnation — which the human intellect cannot penetrate; and these truths must accepted on the authority of revelation. Parallel to them, there are natural truths concerning this visible world which are intelligible to the human mind and are the object of philosophy and science. But Aquinas also opposed Augustinian illumination. Granting that the human soul is intellectual by nature, he maintains that the human intellect by its natural power is able to draw the intelligibles from material objects. Besides its own natural power, the human intellect does not need any special divine assistance in abstracting the intelligibles from the data of experience. Indeed, if Aristotle, a pagan philosopher, could establish a systematic and rational interpretation of the visible world, we must admit that the human intellect has the power of knowing some fundamental principles and is capable of drawing therefrom a perfect science without divine assistance. The truths of faith are above human understanding. They are the object of faith and not of science. Hence philosophy and theology are distinct and this distinction must be retained. (1) Contra Gent., I, 7. (2) Summa. Theol., Part I, q. I, a.1. (3) Summa Theol., Part I, q 1, a. 1; q. 12, a. 4; q. 32, a. 1; In Primum Librum Sent., q. 1, a. 1 and 2.